I spent just one night and two days in Cambodia but what an everlasting impact it left. As part of the ASEAN Media Trip we were hosted for dinner by the Cambodian Ministry of Tourism at Royal Angkor Resort. Along with the dinner, they also hosted a scintillating dance show for us. The scene was like this- we were being served dinner and the dance shows were going on simultaneously. It effectively meant that at the start of every new sequence, we would dump dinner and crouch around the stage to click pictures and make videos. Then we would go back to dinner only to run back to another dance! 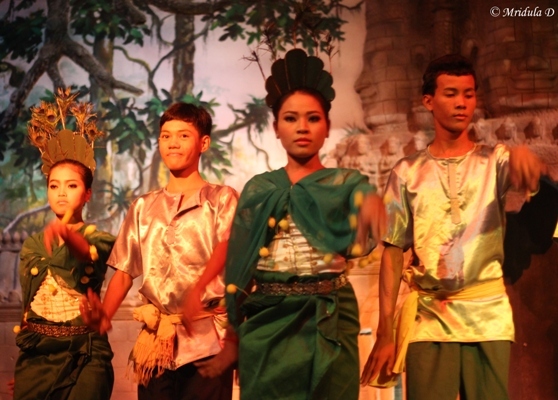 And what fun it was to watch the dances from Siem Reap, Cambodia. 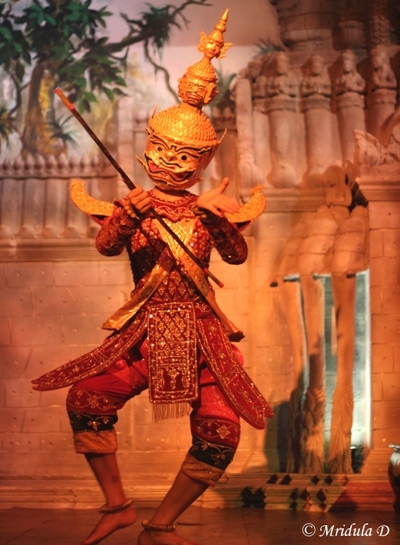 I was quite surprised to see Ramayana being enacted at Siem Reap. I think their version was a little different than what I am used to in India. But it was beautifully done with glittering costumes and great acting and dancing. The accompanying music was wonderful, though I could not understand everything that went on. 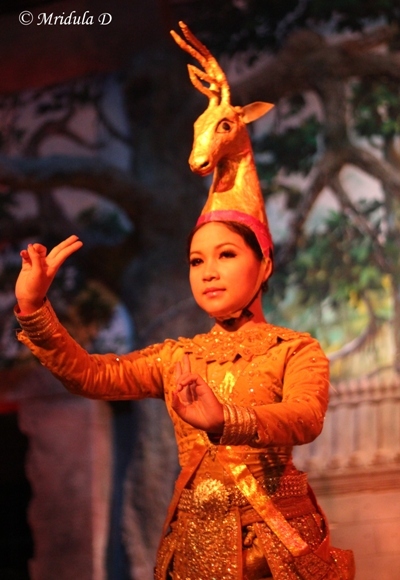 For example, it was easy to relate the golden deer to the Indian version of Ramayana. There was a hermit too in the sequence but beyond it the similarities ended. There were no men, so not sure what happened to the part that is played by Ram and Lakshman. The Ramayana was played out in two acts. Ravan made an appearance in both the acts. At the end of the show he came on the stage without the mask and it was great to see the kind face that the person really had! 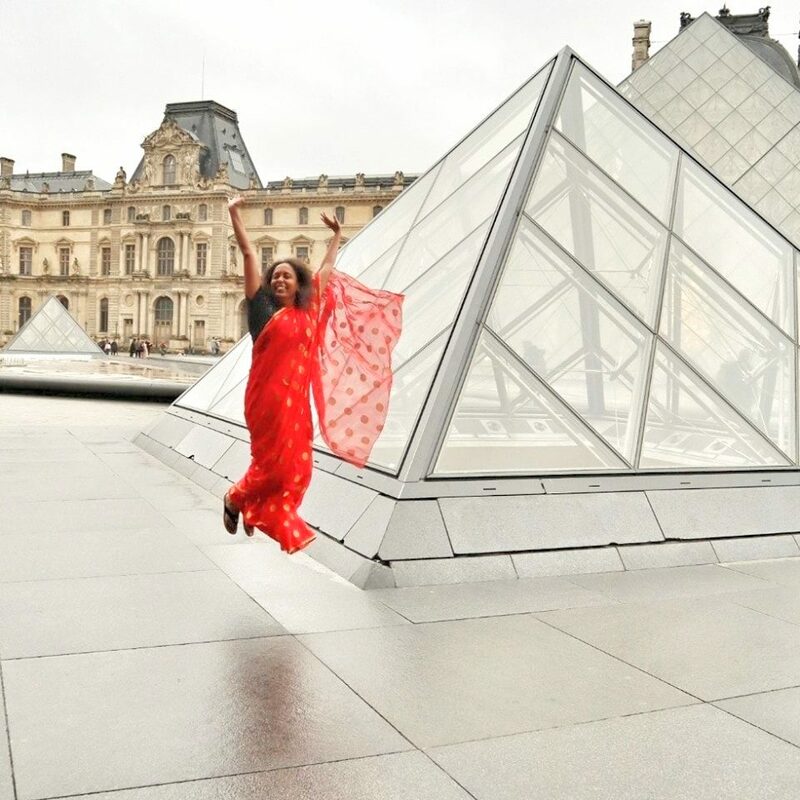 The act ended with a confrontation between Ravan and Sita. It is surprising to see how far and wide some of our old scriptures have reached. My friends say there is another version of Ramayana at Bali too. Hope I can see that too some day. In between the two acts of Ramayana they presented a peacock themed local dance which resembled a little with our Bollywood dances. It was fast paced and fun to watch. The body language of couples seemed quite like the Indian scenario where the boy was interested in the girl but she was not paying much attention to him. The costumes and the peacock feathers added to the drama. 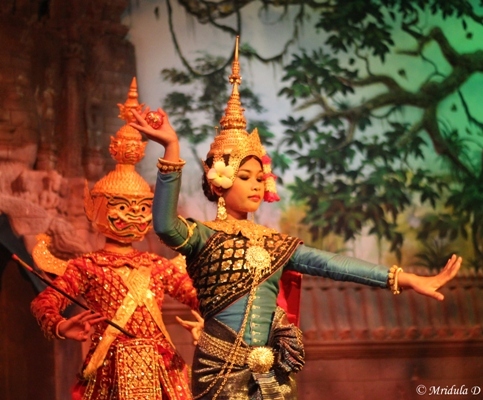 The final act was the beautiful Apsara dance. 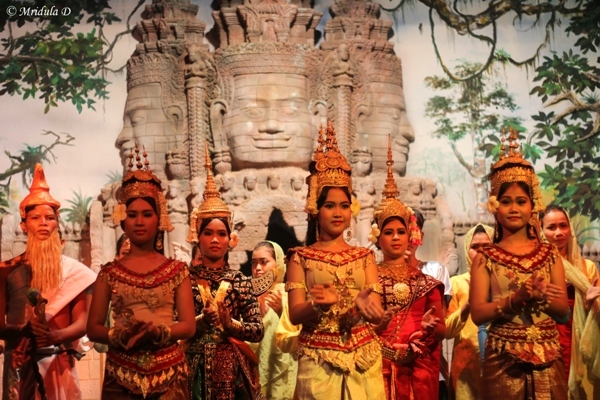 In Thailand and Cambodia many souvenirs have the Apsara theme. But it was only after watching the dance I really got interested in them. 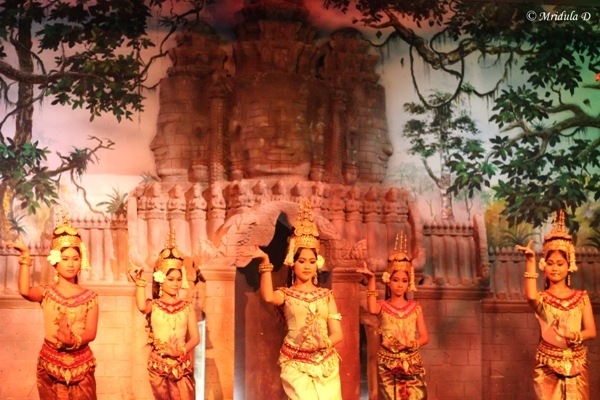 The dances are advertised all over Siem Reap. With so much clicking of photos you could imagine what would have happened to my dinner. The three of us from India were vegetarians and that anyway presented a challenge for the restaurants we went to. They can cope with vegetarians but certainly is not their way of life! Apart from the Orchids Frangipani is another beautiful flower of the tropics. 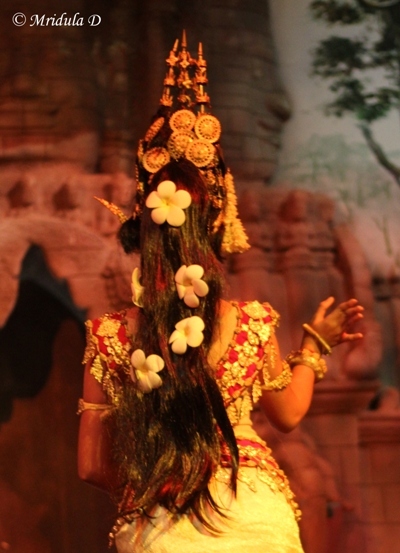 Loved the way they were used in the hair of the lead dancer for the Apsara Dance. I have red and cream ones in my backyard too but I was blown away by the sheer size of the flowers this girl carried in her hair. After the show the entire cast came on stage to take a bow. They also offered us a photo session with them. It was such a beautiful evening. In spite of not being much into dances and culture I realize that I like one when I manage to chance upon one.